As a marketer, I needed to learn different programming languages just to make simple content edits on a website. Keeping up with relevant web development trends while focusing on the next marketing campaign was not an ideal way to spend my time. Let alone having to bug the developers to correct a simple typo. Even if I did take the time to become proficient at coding, nobody else on the marketing team would know this much code so I would become the go-to for any website edit. Then what happens when I’m on vacation… and it simply isn’t scalable since the new members wouldn’t know how to code either. We knew that when it was time for a website redesign we would need a CMS that made uploading and editing content a seamless process. We were looking for something that was simple to use while providing designers with the ability to showcase their talent. If you’re a small or medium business then you probably know exactly what I mean. Especially if you don’t have a team of designers and developers that you can rely on. We had some serious evaluation to do. 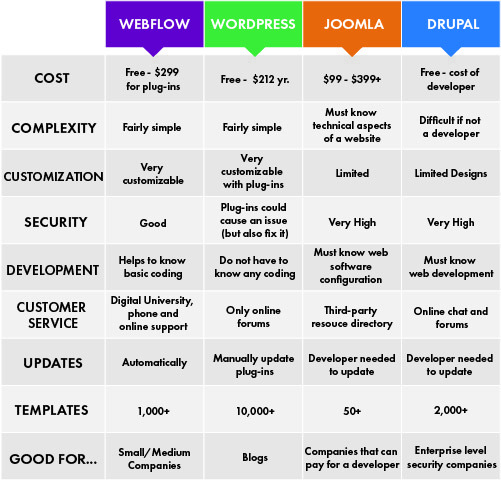 Deciding which CMS is the best was a challenge, but we narrowed our search down to WordPress, Drupal, Joomla, and WebFlow. Determining which CMS is the best may heavily depend on the nature of your website. Throughout this blog, we’ll highlight the pros and cons of each CMS. WHICH CMS IS THE BEST? WordPress has an abundance of templates, but they all look very similar. To differentiate your site and give it a unique style you will need to customize it with HTML/PHP. If you’re a developer, this is not a big issue, but for everyone else this is not ideal. 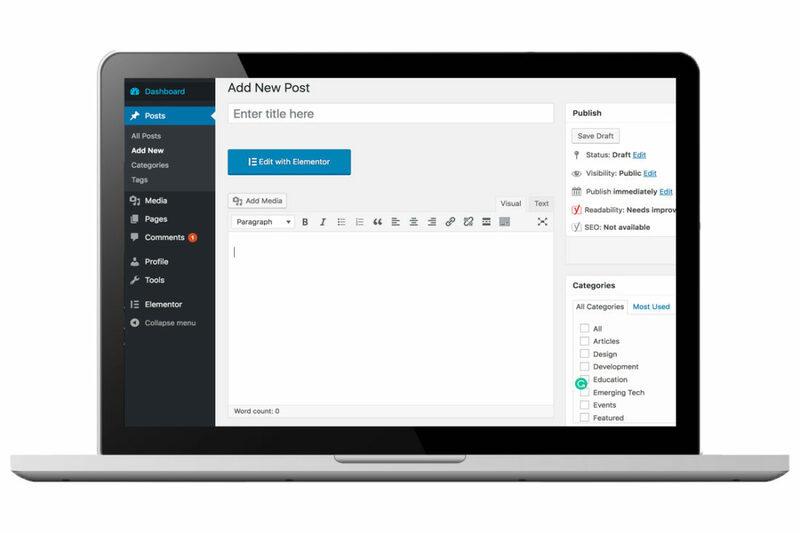 WordPress was originally designed and created as a blogging platform, therefore you can expect to do lots of coding to give it your own twist. You can benefit from using the hundreds of thousands of plugins available on WordPress, but the more of them you have, the more updates you’ll need to make. The code from these plugins may even interfere with the rest of your website and have a negative effect on its performance. WordPress, although it’s an open-source platform, does not have a dedicated customer support team. You’ll have to rely on the experiences of others and hope they’ve encountered the same problems. There are many forums that you can address including the WordPress.org community, but sometimes that isn’t enough. You should expect to learn everything on your own. The WordPress platform is 100% free to use, but over time, the cost of plugins, paid themes, and hosting can become pretty high. You may not be using many plugins, but you will certainly need premium-quality hosting services to make sure your website runs smoothly, which influences the price of your project. Drupal has been a top competitor of WordPress for many years now. This CMS has many more fantastic features, but they aren’t simple to use. If you know how to use them, you can add tremendous value to your website, but these features are useless if you don’t know how to incorporate them. If you are trying to shift your focus away from anything that requires web development knowledge, Drupal is certainly not for you. The backend is much more complex than that of WordPress. Additionally, the updates don’t get handled automatically. You’ll need a developer to take care of this, and sometimes a Drupal update requires an entire website redesign. Drupal offers flexibility on page types without the need for plugins. Instead, they offer modules, but the best ones come at a cost. 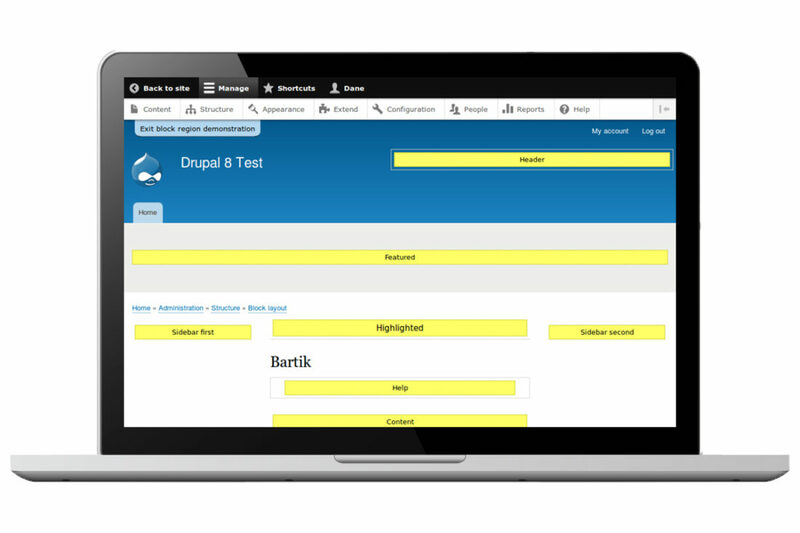 Unlike WebFlow’s ability to create a fully customized design, Drupal has limited themes available. If you choose to use Drupal and want a pretty interface you’ll have to hire a designer, which really defeats the purpose of choosing this CMS. Some of the biggest benefits of Drupal are its high-security measures, fast loading times, and the ability to handle larger sites. It has enterprise-level security and provides in-depth security reports. Ensuring your website is always protected from malicious attacks. Additionally, its default caching feature enables pages to load faster, which increases your overall SEO performance. For a small or medium sized business, I would not recommend Drupal because of the level of complexity and technical skill level required to make edits to the website. Updating copy on your services pages and making minor design iterations should not be a daunting task. Choose a CMS that allows you to focus on the business initiatives that drive results for your business. This CMS has a steep learning curve, but once you get familiar with it, the return is invaluable. However, that means you’re willing to get your hands dirty. Joomla is geared towards developers who are comfortable with web software configuration, working with servers, and dealing with the technical aspects of a website. In regard to design, Joomla falls behind. Their limited number of templates doesn’t give your website the aesthetics it deserves. But the components and modules available give you a bit more flexibility for displaying non-standard content types. Joomla does come with out of the box security features. It allows users to force connections over SSL and enables Two-Factor Authentication. It also includes an additional set of security extensions with documented vulnerabilities. But do security measures stump the ability to quickly and easily make edits on your website? At Seamgen, we believe WebFlow is the perfect CMS for smaller sized projects. It’s ease of use, ability to incorporate custom designs, and not needing to rely on developers makes it our preferred platform. The website development process is simplified and we can comfortably hand off the completed site to our clients. 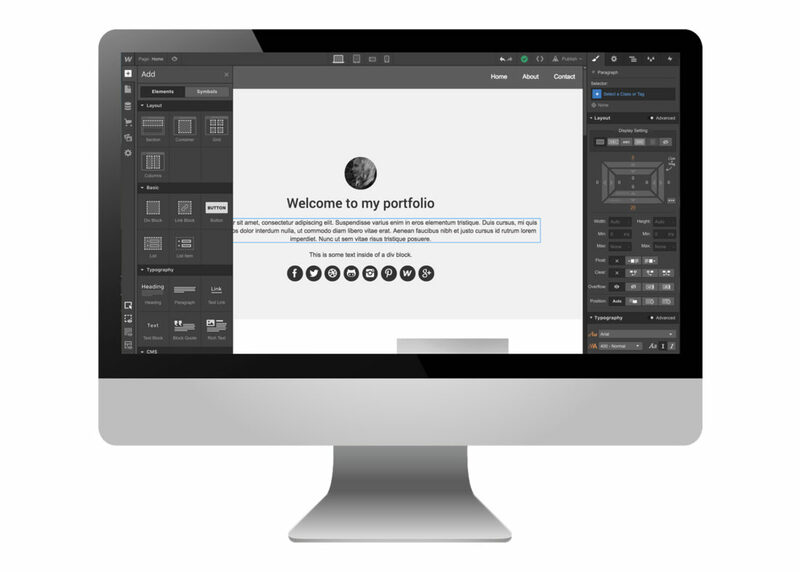 Unlike other content management systems where you may be confined to their templates, WebFlow provides a blank canvas that inspires creativity. You can literally build anything! If and when your site doesn’t require some intricate, one-of-a-kind UI features. Like any other CMS, WebFlow has some limitations, but using API’s enables a higher degree of complexity. And every design choice you make gets translated into clean, standards-compliant code. You’re essentially designing and developing your site simultaneously. With WebFlow, there’s no need to learn a complex backend. You can make edits and updates to your text and images right on the live website. 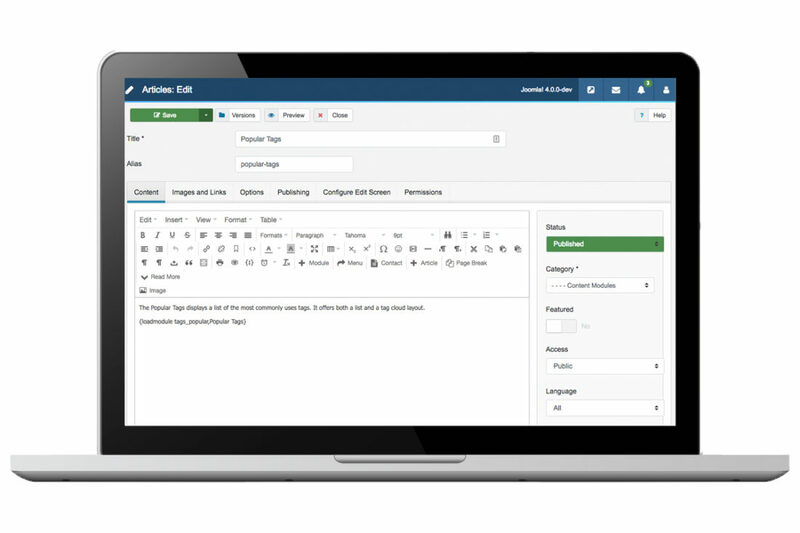 This enables our clients to make edits on their own time without having to rely on our team’s availability to make simple changes. It’s a win-win! If the out of the box components doesn’t suffice, you can use WebFlow’s advanced HTML embedding component. It allows you to incorporate third-party code to add all kinds of functionality to your website. WebFlow even goes as far as providing integrated hosting. You don’t need to look further than WebFlow to get your website up and running. However, if you’d like to host your site elsewhere, you have the ability to export the code and use it whenever and wherever you wish. An additional hosting benefit provided by WebFlow is integrated SSL security, backed by constant threat monitoring. All you have to do is turn on the feature in your dashboard and you’ll have end-to-end SSL security between WebFlow servers and your website. No setup required. Are you thinking of switching platforms? Migrating your content to WebFlow is a painless process. You won’t have to worry about losing any of your valuable data. You can export all your content from your existing CMS and use the import CSV feature to upload all your content into WebFlow in a heartbeat. One of the biggest reasons we recommend WebFlow for small to medium-sized businesses is the customer support it offers. WebFlow has a huge knowledge base offered by its digital University. They have tutorial videos that walk you through every part of the platform; design, hosting, integration, and more. In addition to these amazing video guides, they offer customer support via phone or live chat. As the website owner, you can easily and quickly get answers to your most pressing questions. After analyzing the top content management systems, it is evident that WebFlow has some serious potential for designers and developers to create cutting-edge website experiences. Webflow is a great tool to create production-ready websites from scratch without programming. It’s nearly impossible to draw a conclusion on which CMS is the best. Each platform offers a unique selling proposition with different advantages. It really comes down to which platform will fulfill your specific website needs the best. From our experience, small and medium-sized companies, more often than not, don’t have the resources to easily make website modifications. For this reason and everything discussed above, we highly recommend working with WebFlow. At Seamgen we’ve been designing and developing digital products for over 10 years and we’ve created immersive experiences using WebFlow. You can explore our past projects and browse our services to learn more about our offerings. If you have any questions or are looking for a software development partner, reach out with your questions with no commitment. We’re happy to help!